When you have a child with scoliosis what typically happens, if you’re lucky, it gets caught before it needs surgery. And the parent ends up at the pediatrician’s office, which usually refers them to the orthopedist’s office, and the orthopedic surgeon really has no game plan unless they need surgery. So he says, “We’re going to just keep an eye on it”. Then they are going to worry for a year, which is when the next image is. 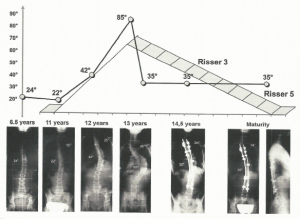 Scoliosis is not a linear problem! It’s not a problem where if it’s staying steady, it will stay steady, and if it’s getting worse it will continue to get worse. It has spurts! And the spurts are almost always correlated to growth. So there’s going to be this thing coming up (the adolescent growth spurt) where the problem usually goes berserk. That’s when the kids grow the fastest. Because the standard process for monitoring the curve is to monitor it once a year, a kid can grow three inches you know, in half a year. Certainly, in a quarter, we see kids growing an inch commonly. So a kid grows an inch in just three months and in a year a kid can grow two, maybe three inches during a really rapid growth spurt. So between those X-rays, you can go from “well we’re fine” to “oh no we’re at surgical threshold”. The point I’d like to make is while watching. If you’re watching a problem and you’re checking it once a year are you really watching it? If I told you I was going to leave my house and I wanted you to keep an eye on it and you checked it once a year, would you really be watching the house? They’re doing the same thing. Why are they only watching it once a year? To watch it requires using an ionizing radiation that’s damaging to one’s health. So when they watch it, and they go, “we need to watch it to see if it’s going to get worse”, but they only watch it once a year because it’s bad for the kid. So that’s why, I personally am so bullish on MRI, standing MRI. 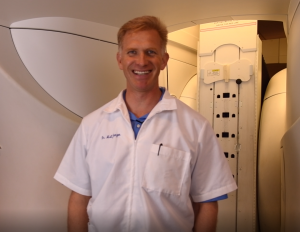 Because what’s the penalty for taking an upright MRI of the spine? There is no health penalty. There’s none. So now, if we want to watch it, if we wanted to we could watch it once a week, once a month, every few months, and we’ve stuck to the quarterly because that tends to be enough. If a kid grows an inch in a quarter we’re getting another image. One of the keys and I like to say one of the secrets, to our success is that we watch it much more closely. And we can watch it more closely without harming their health because of a completely radiation-free imaging technology. Both Mike and I have daughters with scoliosis. Do you know how many x-rays he’s done on his daughter? None, he’s done it all with him MRI. And I’ve done one or two on my daughter, and we’ve used low-dose x-rays, and we’ve used about 16 MRIs. It’s easy to figure out what we ought to be doing for all our patients when we know what we do for our own daughters. Why wait six months to a year to check to see how scoliosis is doing, when your child can grow an inch in a month or two.